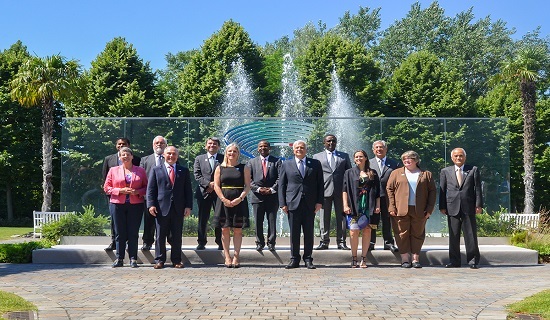 On 11-12th June Bologna hosted the Environment Ministerial Meeting of the G7. The meeting was attended by the Environment Ministers of the seven countries and the Commissioners of the European Union for Environment and Climate. Furthermore, at the meeting was attended by the Environment Ministers of four outreach countries particularly committed to environmental policies, in representation of emerging countries: Chile, Maldives, Ethiopia and Rwanda. The Bologna meeting focused on the priority themes of the global environmental challenge, such as the state of implementation of the goals set by the Paris Agreement to fight climate change and the Sustainable Development Goals set by the UN 2030 Agenda. For the first time, the Environment Ministers discussed in a G7 meeting themes at the frontier between economy and environment: Environmental Tax Reform, Environmentally Harmful Subsidies, the role of Multilateral Development Banks, Green and Sustainable Finance. The Ministers discussed also on traditional G7 important issues, such as Marine Litter, and Resource Efficiency. On the latter theme - the core of circular economy - the goal of the meeting has been the launch of a “Bologna roadmap”. The roadmap focuses on some crucial issues: resource efficiency indicators, citizen involvement and awareness on food waste, economic analysis of the efficient use of resources. The Ministry of the Environment prepared a document to share with the other participants in the Environmental Ministerial. The Bologna meeting was the opportunity to recognize and support the commitment of the entrepreneurial and university worlds on environmental issues: during the two side-events scheduled for Sunday 11th June, three companies and two universities coming from each G7 country, among the most committed to achieve green innovation, discussed together on the key issues about environment and sustainability. To pave the way to the Environment Ministerial meeting, the Ministry of the Environment organized preparatory meetings with international organizations such as OECD (Organisation for Economic Cooperation and Development), UNEP (United Nation Program for the Environment) and WRI (World Resources Institute). On 20-21st April, for example, the Marine Litter G7 Summit was held in Rome to discuss the implementation of the G7 Action Plan to Combat Marine Litter, adopted in the 2015 during the German G7 Presidency. From the workshop, some interesting points were presented at the Environment Ministerial of Bologna. The initiative #All4TheGreen prepared the city for the meeting, with a calendar of over 70 scheduled events. #ALL4THEGREEN included various activities and projects, and is backed by the World Bank's global partnership program Connect4Climate, with the support of the Ministry of Environment and under the auspices of the Italian G7 Presidency. The calendar of initiatives was organized thanks to the support of dozens of public and private bodies (The City of Bologna and Emilia Romagna Region, Alma Mater University, UN Sustainable Development Goals, Bologna Cineteca Foundation, Bologna Welcome). The event enjoyed the joint participation of institutions, companies, environmental associations, recycling consortia and universities. Other 'side events' during the G7 Environment Week in Bologna focused on the contrast to the plastics in the seas and on food waste.